This will be how all space stations are built: Not as one piece, but accumulated in bits and pieces. Smaller stations will be symbiotically combined into larger stations. 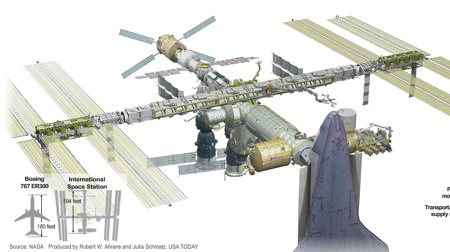 View this mesmerizing animation by USA Today for a timelapse account of the ten year growth of the first International Space Station. I realized from watching this wonderful summary that space stations will be like cities: ever changing, ever accumulating, ever growing. Some may grow to be a century old, full of new layers but and contain ancient parts they cannot shed. There have been quite a few science-fiction works (mostly books) with that as a premise. In the TV realm, Babylon 5 was pictured to be decaying (containing burned-out sectors, slums, etc.) within only a couple years of its completion. I can’t think of any well-known novels set on old stations at the moment, but there are plenty of less well-known ones. My favorite moment looking at that ISS interactive was when I moused over a red button on the future Node #3 Cupola. The legend ????? appeared. That gizmo must be SECRET. Heeheeheheh. While future space station technology may allow accumulation of modules for a long time, currently they cannot due to rapid material breakdown with exposure to conditions in space. I gather Mir became pretty disgusting towards the end too. It will be interesting to see whether the inflatable materials used by Bigelow with fare better.